We enjoyed some of our best meals of Vietnam in Hoi An, which is renowned worldwide for its culinary offerings. You would be hard pressed to find better Cao Lau, Com Ga, Banh Xeo or Banh Mi anywhere in the country. 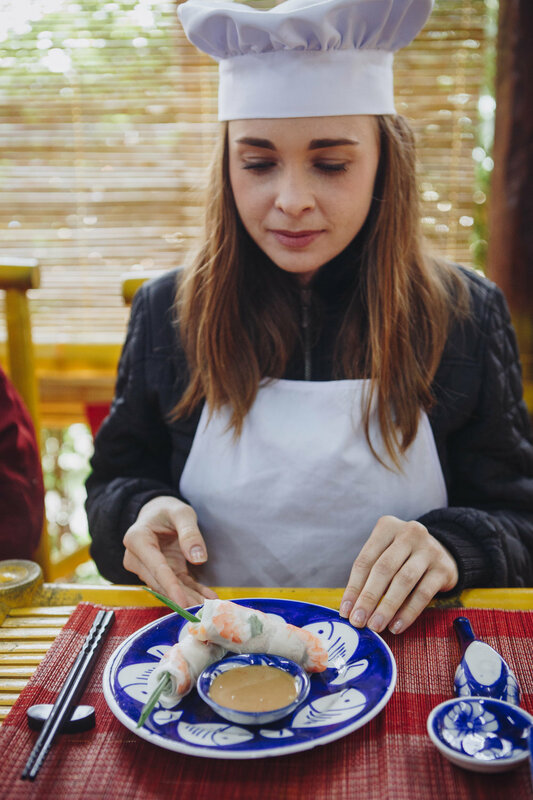 On day 3 in Hoi An we booked a cooking class with Hoi An Eco Coconut Tours to learn how to make some of these legendary dishes ourselves. Fresh spring rolls, homemade peanut sauce, Banh Xeo and papaya salad with prawn crackers are some of the dishes we will be happy to import back to the U.S. on our return. We were enchanted by the numerous vignettes one can experience in a walk through Ancient Town at night. Shop-owners and residents burn incense and various offerings in small metal pyres on the street to honor their ancestors. This is especially important around the season of Tet. During this time they invite the souls of their deceased family members into their homes to join in welcoming the New Year.